Pink and brown bedding - Who would have thought to put these two colors together for a baby's room? Well we did, and the combination is simply beautiful. Pink and brown crib bedding appeals to the softer side but when you combine brown earth tones it creates a whole new stylish design. See what we mean in our pink and brown selection, which includes: Soho Pink and Brown crib bedding, Pink and Brown Paisley bedding, and Abby Rose bedding. (Isn't that a great name?) How about pink and brown polka dot crib bedding? One of our very popular crib bedding sets, the Pink and Brown Modern Dots Baby bedding set. Be sure to look at our accessories, because you'll want to complement your beautiful pink and brown crib bedding choice with exquisitely coordinated room decor which is sure to enhance and finish off your ideal pink nursery theme. Decorating Ideas: Why Pink and Brown Bedding May Work for you! If you are decorating a nursery for a baby girl, your first thought is probably to “think pink”. Tons of expectant parents still love this classic color choice for their little girl’s room. After all, pink is pretty, feminine, and it gives you a wide array of options. You might not instantly think about using pink and brown bedding for your baby nursery, but the combination is actually quiet modern and beautiful. Brown is traditionally used for adult bedroom motifs, but pink and brown baby bedding that pairs a chocolate hue with a classic ballet pink produces a combination that is simultaneously classic and modern. Beyond Bedding has a complete line of beautifully coordinated pink and brown baby bedding sets perfect for any little girl’s nursery. 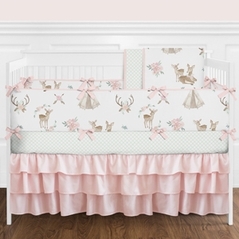 Pink and brown crib bedding is a truly wonderful choice for your baby girl nursery because it is both rich and sweet. And right now pink and brown baby bedding is a huge trend in nursery design. When choosing a wall color, remember that paint will always be more dramatic than it appears on the color tile, so always choose the lightest shade that you find appealing. If you choose pink as the wall color, you can easily match the paint to your baby bedding set. If you prefer brown, just try to avoid using a dark shade on the walls; instead opt for a pale brown that would still compliment your pink and brown crib bedding. Maintain a nice balance between the pink and brown by remembering that brown will always have a more dramatic visual impact and you can’t go wrong. When it comes to the bedding and window treatments, have fun with fabrics and create visual texture by choosing something with an interesting design. Pink and brown polka dot bedding is both a fun and beautiful choice for a baby girl nursery. If you’re concerned that pink and brown bedding is too overwhelming for a baby girl nursery, take a look at Beyond Bedding’s Pink and Brown Modern Polka Dot Baby Bedding, which incorporates a soft pink shade, light and dark brown, and white to create a wonderfully balanced color scheme. A crib, rocking chair and dressers in a dark wood finish against the trendy colors and patterns in your bedroom accessories will create a stunning overall effect, while seamlessly continuing the brown and pink bedding color scheme. Beyond Bedding offers expectant parents a dozen of pink and brown crib bedding sets to choose from. Each pink and brown bedding set has everything you need to fully outfit your little girl’s crib with style and luxury. And to create a perfectly coordinated space, we have matching bedroom accessories that go along with each of our baby bedding sets. So consider adding a modern touch to your baby girl’s nursery with a stunning pink and brown bedding set from Beyond Bedding.